Christmas is fast approaching so if you're stuck for ideas on what to give your vegan loved ones, I've put together this guide of presents I can wholeheartedly recommend. These are both gifts I've happily received myself and a few other things that I've used and loved for a while. I'm a big fan of The Vegan Kind, having been a subscriber for over two years now. If you're unfamiliar, they curate a monthly box of vegan food and lifestyle goodies such as chocolate, marshmallows and candles. Opening my box is something I always look forward to and it's so much easier to have some tasty vegan snacks around when you don't feel like making something. You can read my posts about some of their past boxes here and here. Any Lush fan will love this tote to show off their support for animal rights. Made from Fair Trade organic cotton, it's a really great way to raise awareness of the cruelty-free message and of course means you don't need to use plastic bags. This is such a fantastic magazine if you're interested in cruelty-free and veganism. Every issue has a mix of cruelty-free news, interviews with well known vegans, animal rights articles and delicious recipes too. I love the feeling of community I find reading this magazine and it was one of the very useful resources that helped me to go from vegetarian to vegan. 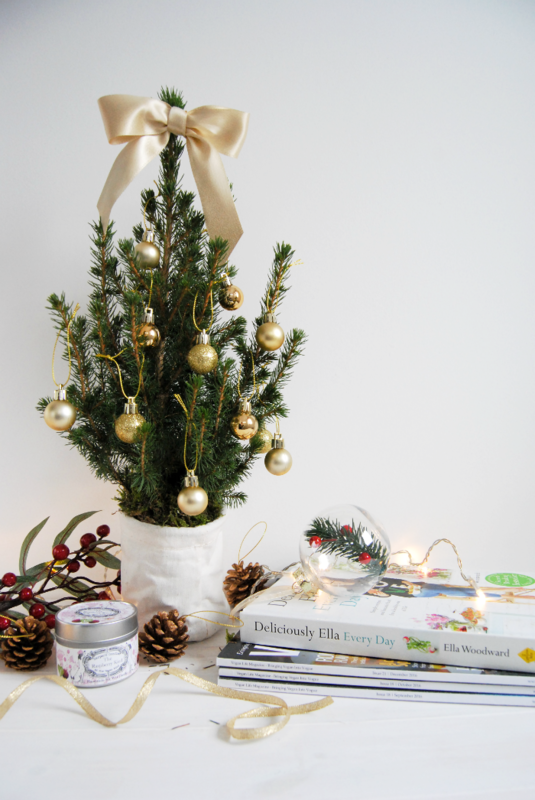 A potted Christmas tree is a great environmentally friendly option as you can plant it in your garden after the season to enjoy all year round. If you want to keep things even more sustainable you can make your own Christmas decorations from natural materials like dried fruit, cinnamon sticks and pinecones. The flower delivery company Bloom & Wild have this beautiful table-top tree* that arrives through the letterbox, and even comes with moss and a little collapsible canvas pot to keep it in. It's really so exciting to get a tiny Christmas tree in the post! This makes for such a pretty and unusual present that's also very thoughtful if someone's out at work all day and isn't home for deliveries. Soy candles are the best cruelty-free alternative to beeswax, and the gorgeous vegan ones from Harper's Bizarre are handmade from sustainable sources. My favourite is Jingle Bells - a warm scent of spices and oranges that just smells so much like Christmas. These candles burn for hours and certainly make the holiday evenings feel cosy. Such a helpful present for anyone just getting started with vegan cooking. Currently my most used recipe book is Deliciously Ella Every Day. Complete with gorgeous foodie Instagrams and weekly shopping lists, I really like that the same ingredients are used throughout for practicality. So far all the recipes I've made have been much quicker and easier than I expected, thanks to the short ingredients lists, and turned out really tasty too. It is a plant based cookbook so sometimes honey is included in the recipes, but this can easily be replaced with maple syrup. Keep It Vegan is another great one, particularly if you want to make something a bit special like a 'shepherdess pie' or mint chocolate birthday cake. Most of the ingredients are easily available and there's such a variety of recipes that you'll never get bored cooking vegan. Both books have encouraged me to be more confident in my cooking and learn to use up what I have, as well as eating healthier too. At £2 you can't go wrong with this mini collection of dairy free chocolate! I haven't tried this yet but I'm hoping it'll be under the tree for me this year. Tis the season for Christmas shopping! 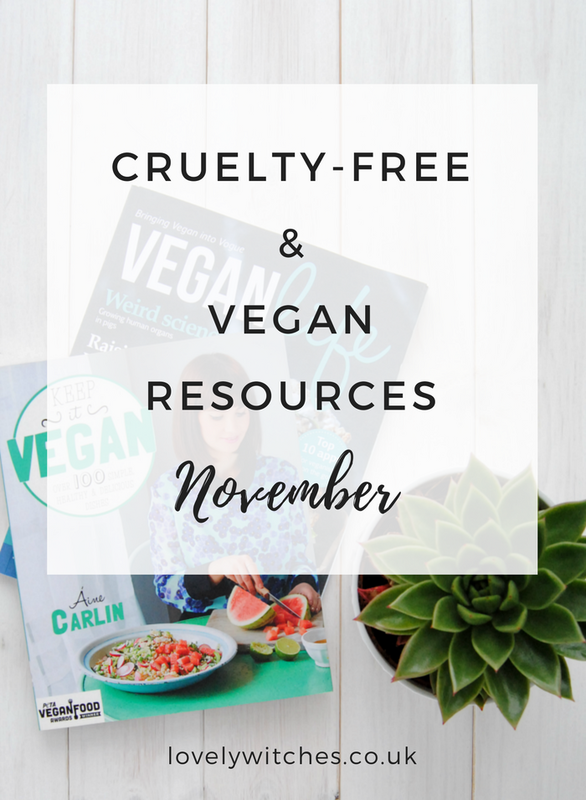 I've rounded up a list of cruelty-free and vegan gift guides for this year, so you'll have no problems deciding what to buy for any vegans in your life (or treats for yourself). 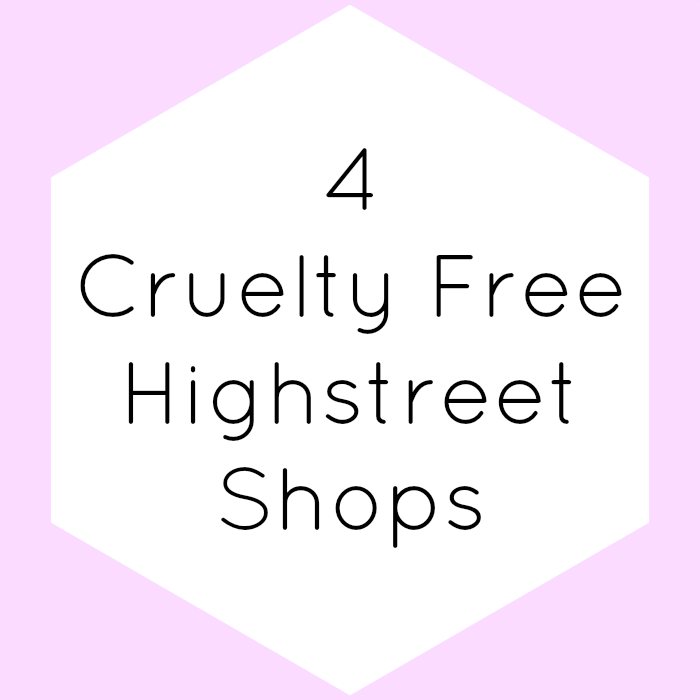 Parent companies were a hot topic again this month and whilst there's a lot I could say on the subject, I always think it's best for people to make their own decisions on who to buy from and to support each other's cruelty-free choices. India banned the use of the Draize test on rabbits for drug testing, ending a notoriously unreliable practise to adopt more advanced and humane alternatives. Estée Lauder bought out cruelty-free brand Too Faced. Too Faced have stated they intend to remain cruelty-free and will not be entering the Chinese market. This is Estée Lauder's second acquisition of a cruelty-free brand in recent months, after they bought out make-up brand Becca, who also state they will stay true to their cruelty-free status. 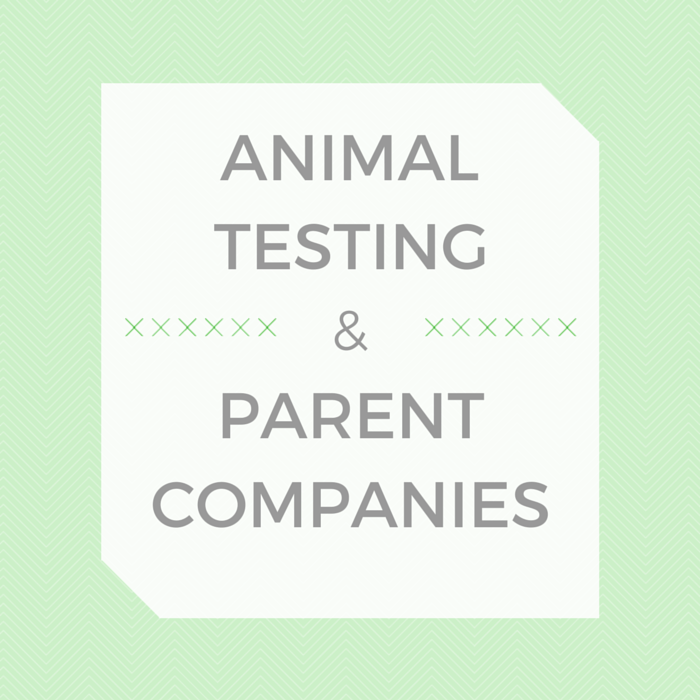 If you're confused about what all the recent buy outs mean, Vicky put together this excellent guide to explain Parent Company Animal Testing. Tofurky are launching a range of vegan sandwiches and they sound so good. Pre-packed vegan lunch options can be pretty scarce so these are long awaited. A Vegan Christmas Festival is coming to Cardiff this Sunday December 4th. The first festival was a great success, hosting all the best local vegan food and this one has another excellent line up of tasty treats. If you're looking for a vegan event near you, Sarah has some great cruelty-free Winter Dates For Your Diary. 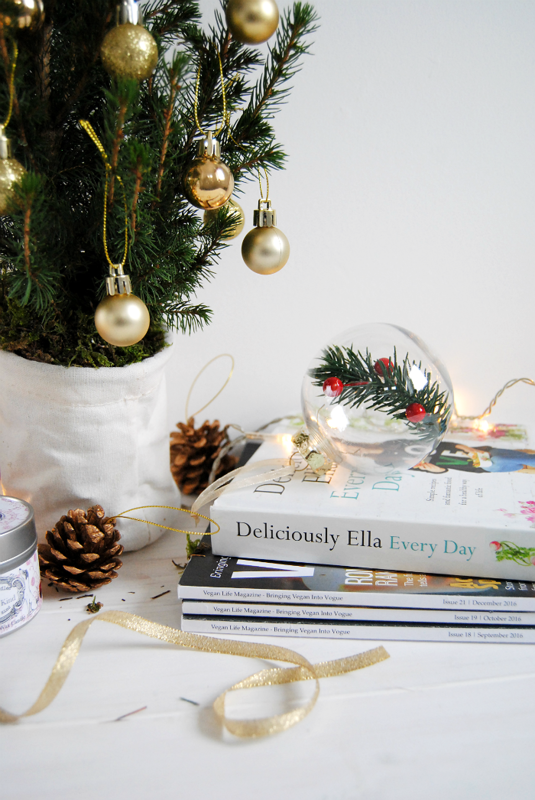 Vegan Lifestyle | A Festive Gift Guide from (not so) quiet girl. The Mini Vegan Christmas Gift Guide from Katie Vibes. Vegan Holiday Gift Guide For Him from Ethical Elephant. Vegan Christmas Gift Guide from Spice Box Of Earth. Why I'm Buying Second Hand Gifts This Year from What Lauren Did Today. Time to start some Christmas shopping! 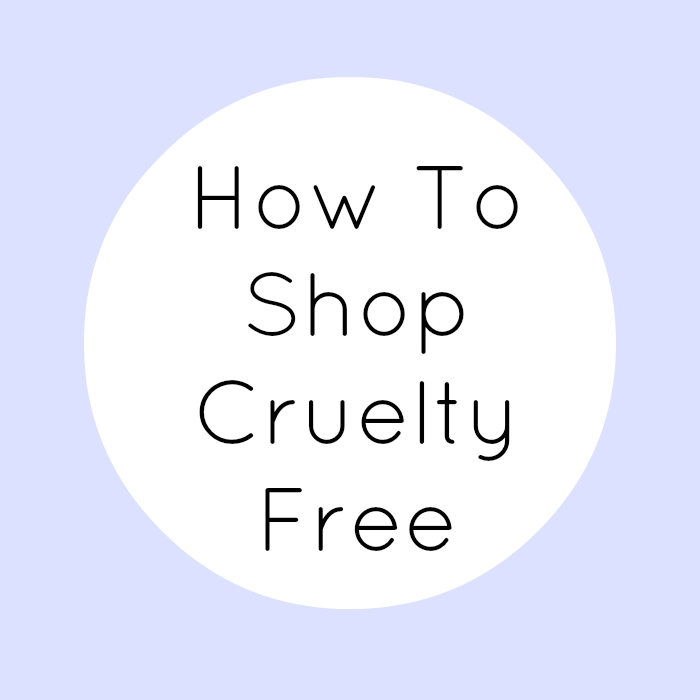 Whether you have a vegan to buy for or want to give your friends some cruelty-free gifts this Christmas, these picks are a great way to start. I've put together a few ideas and my own recommendations to make things easier, plus all these stocking fillers come in at under £5 each so they're very affordable too. A must this time of year and this one from Superdrug has seen me through the last couple of winters really nicely. It's never greasy and lasts for ages as I only need to put it on once or twice a day. If you're in need of something a bit more intensive I'd really recommend the Rescue Balm too, which works so well to soothe your skin if it's feeling sore. It's actually hard to believe how good it is for the price and fantastic for anyone who works with their hands. Lush bath bombs are such a popular stocking filler and it's no wonder why! One of my recent favourites is the huge Intergalactic, a mix of peppermint and grapefruit oil that makes big, blue, glittery bubbles. Their Christmas range has some adorable characters like the Peeping Santa and Christmas Penguin bubble bars that are almost too cute to use. 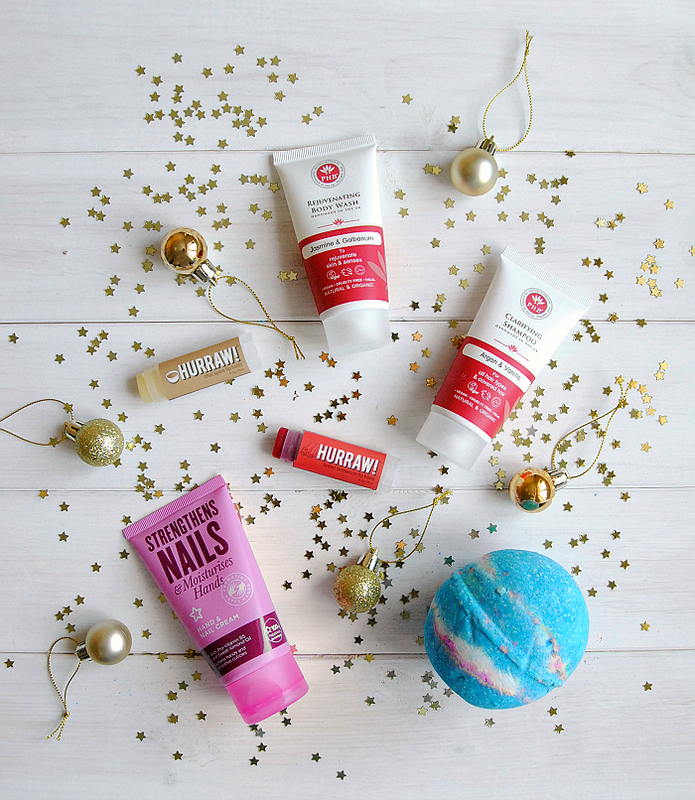 I love mini products for trying out new things, they're great to travel with if you're going away for Christmas and the perfect size to put in a stocking. This mini shampoo and shower gel from PHB Ethical Beauty are handmade in the UK, palm oil free and 20% of the profits go to charity. Argan oil and vanilla make the Clarifying Shampoo* incredibly hydrating so it's a great option for dried out or coloured hair. Since I've started using it, it's made my hair so shiny and I've even had a few compliments. The Jasmine Body Wash* is a natural blend of floral oils with a lovely botanical scent. Even though it's made without SLS it foams up into a rich lather and feels luxurious and soft. I always think nice shower treats in the winter can do wonders for your mood when it's cold and grey outside. Something I always have in my bag, my current picks are the Hurraw! natural flavours made from organic cold pressed oils. My regular is Chai Tea which feels very hydrating and soft and has lasted me nearly a year already. The Cinnamon flavour* has a red tint and tingles a bit when you put it on, just enough to wake you up in the morning! If you know a cinnamon lover this is a perfect little Christmas gift as it has a spicy taste and feels very festive. More brilliant stocking fillers are Barry M's nail polishes, and you can't go wrong with the classics - Vintage Violet is an all time favourite of mine, a grey purple that suits any occasion. Berry Cosmo is a gorgeous, deep plum shade which looks amazing with a sparkly glitter on top. They also have two limited edition shades for Christmas this year, a metallic rose gold named Twinkle Twinkle and glittery pink called Nutcracker. Let me know what you think of these stocking filler ideas and what you'd add to the list. It does seem lately that every month another cruelty-free brand has been bought by a company that tests on animals. 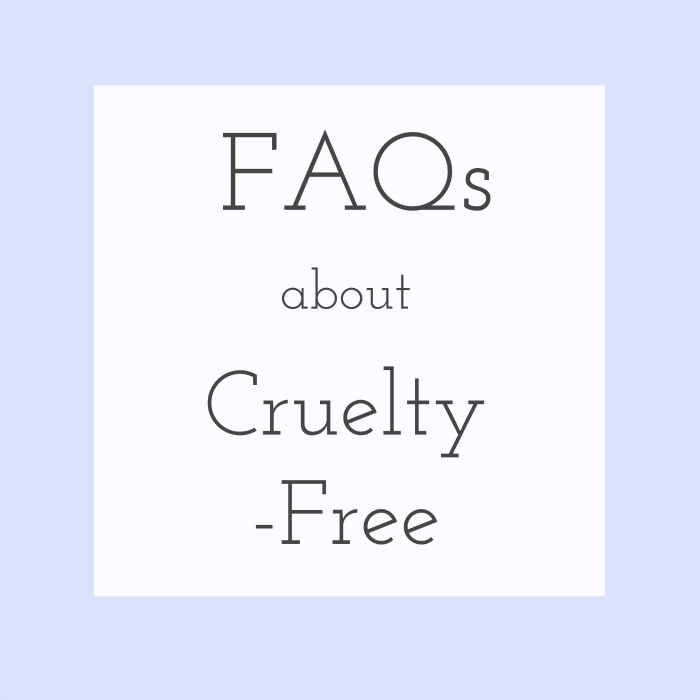 But, to try and find the positive in these situations it means that the ever growing demand for cruelty-free beauty is being acknowledged. Often brands that have been bought out will stay true to their cruelty-free stance. And in really good news, more and more countries are passing legislation to ban animal testing for cosmetics, with hopefully the USA and Canada to follow suit soon. Taiwan banned cosmetics animal testing, sending the message worldwide that it's an outdated and unnecessary practice. Previously cruelty-free make-up brand BECCA have been bought by Estée Lauder, and are yet to disclose whether they will enter the Chinese market along with Estée Lauder's other brands. 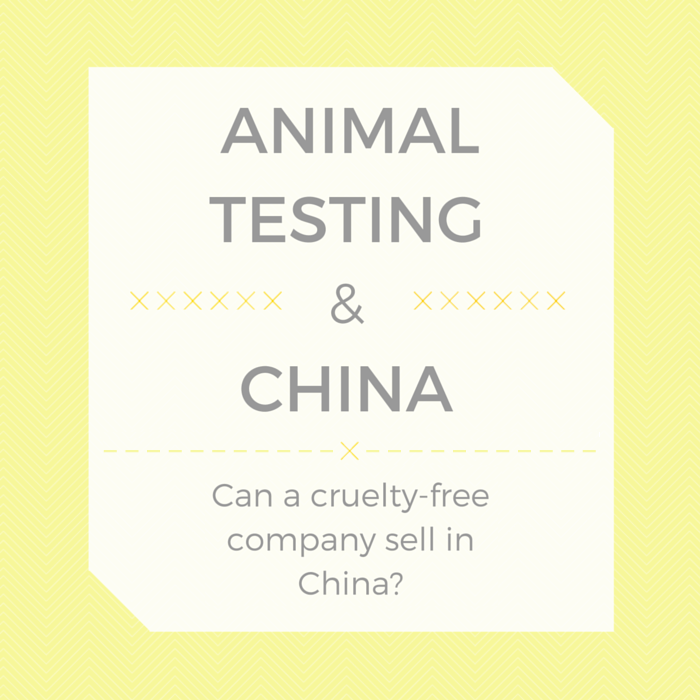 If you'd like an insight into how a huge corporation like Estée Lauder can justify testing on animals, read their interview about selling in China and the future of the cosmetics industry. Excluding honey from your diet may sound extreme to some, so why don't vegans eat honey? 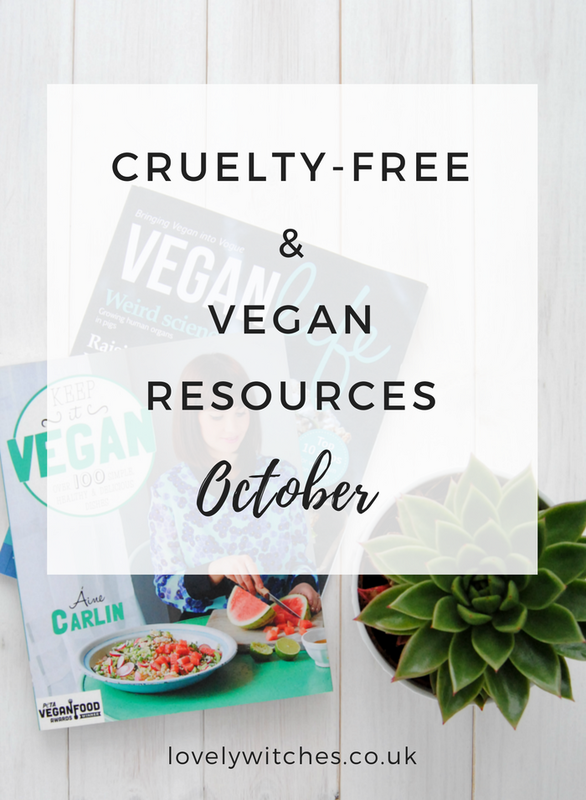 Nadia recently wrote a bunch of excellent posts about veganism for Blogtober, and I'd recommend reading them all. My favourites included 5 Comebacks To Common Questions Vegans Get Asked and Should Your Cat Be Vegan? 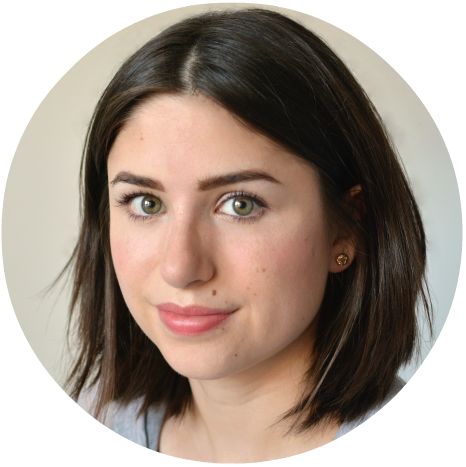 If cooking in bulk has been something you've been meaning to do for ages, Bianca has some great tips for getting started with a plant based diet. Beth is switching to veganism, and I've really enjoyed reading about how she's been cutting out meat and dairy. And lastly, Tesco have released a dairy free chocolate selection box for Christmas. Unsurprisingly it seems to be sold out but it's already at the top of my Christmas list.